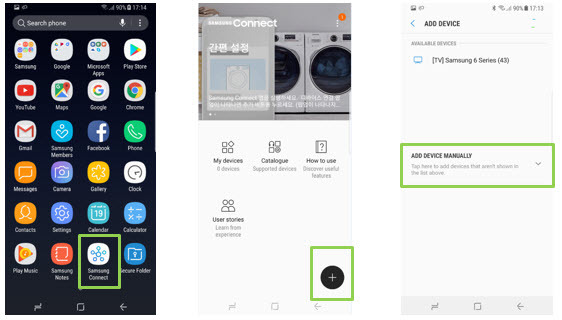 Samsung Connect Home: How to connect the Samsung Connect Home with a mobile device? Samsung Connect Home - How to connect the Samsung Connect Home with a mobile device? Q: How do I connect the Samsung Connect Home with a mobile device? A: To connect the Wi-Fi hub with a mobile device, you must install the Samsung Connect app on the mobile device. You can download the app from Galaxy Apps, Play Store, or App Store. • Visit www.samsung.com to see compatible devices with the Samsung Connect app. • You must register and sign in to your Samsung account to use the Samsung Connect app. • Supported features may vary depending on your mobile device and its operating system. 1. Connect one end of the Ethernet cable to the hub’s WAN port (IN) and the other end to the modem’s LAN port. 2. Connect the adapter to the Wi-Fi hub. The Wi-Fi hub will turn on and the indicator light will flash green. Note: Use only Samsung-approved adapters (12 V/2.1 A or higher). • You can use the Wi-Fi hub only when you connect the Wi-Fi hub to an adapter. • To save energy, unplug the adapter when not in use. The adapter does not have a power switch, so you must unplug the adapter from the electric socket when not in use to avoid wasting power. The adapter should remain close to the electric socket and be easily accessible while using it. 3. Launch the Samsung Connect app on the mobile device. The Wi-Fi and Bluetooth features will activate automatically and search for available devices. 4. The Wi-Fi hub will be detected automatically. Tap ADD NOW. If the Wi-Fi hub is not detected, tap → ADD DEVICE MANUALLY → Wi-Fi Hub, and tap your Wi-Fi hub’s name. 5. Enter a network name and password to assign to the Wi-Fi hub. To register IoT devices via the Samsung SmartThings Hub feature, tick Set up SmartThings Hub to activate it. 6. Follow the on-screen instructions to complete the connection.